Today, immigration detainees in two prisons in Ontario are beginning the third week of their hunger strike. The last few days have been extremely hard on hunger-striking detainees, please read below to see why. This is a crisis and we need your support to make sure that Minister Goodale does the right thing and meet with the detainees before a tragedy occurs. Ask him to meet the detainees. Here’s a recap of what’s happened in Week 2. For Week 1 recap, click here. On July 18, organizers in Peterborough visited MP Maryam Monsef’s office demanding she support immigration detainees. See pictures here. Activists also did a solidarity banner drop in Vancouver. On that same day we heard reports that guards were placing food plates inside the cells so that hunger striking detainees had to stare at their food, rather than not serving those who were refusing. On July 19, protesters were outside a secretive immigration consultation with Minister McCallum in attendance in Toronto, while indigenous activists and allies confronted Minister Ralph Goodale in Regina demanding that he meet with immigration detainees. See pictures here. Instead of agreeing to meet, Minister Goodale published a blog in Huffington Post. The same day we released a statement in response to SIU’s brutal and dehumanizing press release about Abdurahman’s death. It’s the most read post on our site, read it here. On July 20th, we responded to Minister Goodale’s blog with our own, insisting he must act before more people suffer or die. Read it here. On July 21st, activists in Ottawa protested outside the Ministry of Public Safety’s offices demanding that Goodale meet with immigration detainees. See photos and report-back here. In Toronto, doctors, lawyers and immigration detainees did a press conference calling on Ontario to step in and urge the Federal government to meet with detainees. We also shared a story of Black youth and allies visiting detainees in Lindsay. 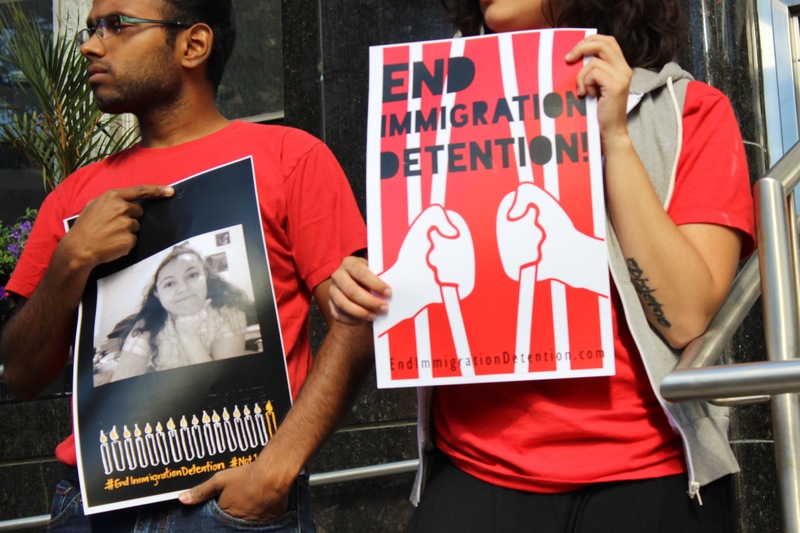 July 22 – 24, On Friday, End Immigration Detention Peterborough released an open letter to MP Maryam Monsef, read it here. Disturbingly, we are seeing the prison authorities, likely under CBSA instructions, doing everything in their power to break the strike. One of the key strike organizers is being deported today, Monday July 25th after 26 months in prison. Others are being threatened with transfers, and some long-term detainees are being promised release but no real steps have been taken. Detainees are also not being allowed out of their cells most of the time, and this lockdown is making it difficult for detainees to organize and communicate with each other and those on the outside. As some detainees get sick, or are under enormous pressure, they are choosing to start eating. We honor their courage for continuing for so long. Others are continuing to refuse food. We will support them, no matter what they decide. Please take action today by calling, emailing and tweeting, see above for contact info. Huffington Post: Minister Goodale: Immigration Detainees are running out of time. CBC Ontario Today: Do immigration detainees belong behind bars?